Round plastic charity button promoting patriotism in response to the September 11, 2001 terrorist attacks on the World Trade Center in New York City. Cyndy Fulhage, of Beloit, Kansas, produced this button shortly after the attack. After designing the graphics, Fulhage had the buttons assembled in Beloit at OCCK, an organization that supports the disabled. Fulhage then sold the buttons at local businesses, banks, and veterans' organizations. The proceeds were donated to the American Red Cross disaster relief efforts in New York. 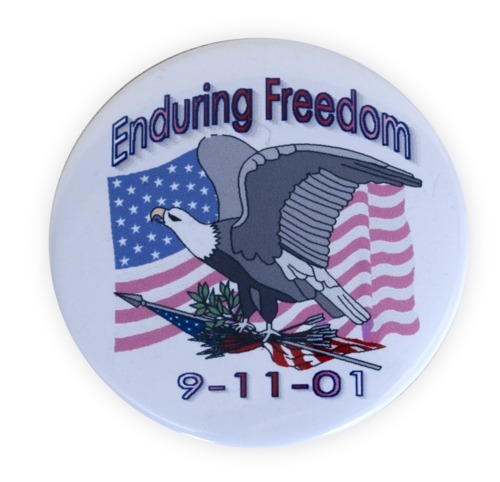 The button references "Enduring Freedom," the name assigned to United States military operations in Afghanistan following the September 11th attacks.